After months of talking and political science classes (for the dinosaurs) 8 potential candidates for The Dinosaur Party have emerged. Beginning tomorrow you will be introduced to these fine specimens of political acumen. One candidate a week, for the next 8 weeks will deliver a speech. At the end of this period you should have a good idea of who's who, and which ones you feel speak to you. Mind you this is not a vote as to who you want to be the candidate. That will come later. This is merely a preliminary. A chance to get to know what each dinosaur stands for, in their own words. 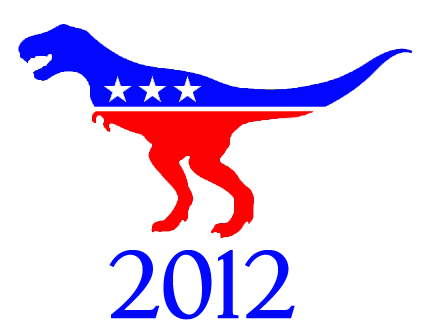 Show your support The Dinosaur Party on Facebook and Twitter. haha, awesome! I've been waiting to see this campaign progress! This will be good and I will be back. I suspect many laughs are coming too, Robyn. Dinosaur humor is the best kind of humor. @Alex & @Marlene, It should hopefully be worth it. @Camel, Dinosaurs are so busy these days, it took awhile to get them all together. @Kal & @Robyn, I hope you two won't be disappointed. Getting dinosaurs to write speeches is no mean feat. How do T-Rex reach the paper holding a pencil in those tiny little hands. Or do they dictate their speeches to others? @Kal, they delivered the speeches at a public forum, others have written them down for the sake of posting. ooooooo I like a candidate that can speak off the top of his head like that. sounds good, i am liking them on FB! Man! I have to burn my wig party card now. Dino all the way!!!! Okay, I retract the vote! I'm catching and reading backwards. I'll be checking out all the candidates! I would vote for the dinosaur any day.